My poor daughter. 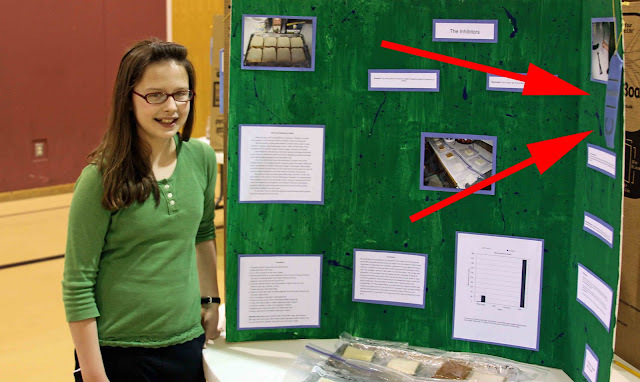 She participated in an end-of-the-year piano recital on Sunday, an end-of-the-year band concert on Tuesday, and an end-of-the-year Science Fair on Thursday. She has been pushing herself to do well in school because she wants desperately to attend the end-of-the-year 6th grade camping trip, and students are not allowed to go if they have an F in any subject. I think she can stop worrying. The other girls conducted classy experiments like which ingredients make a better-tasting cake and will plants grow better with music playing in the background. My daughter? MOLD. But, hey! Blue Ribbon! Good for her. It is nice to see young people doing so well. I remember doing a science experiment on mold in the 5th grade. I still have the papers somewhere. Great job! My kids are still young. I have so much to look forward to. Wow, she's got a lot on her plate for a 6th grader. I remember feeling like I had a lot going on, but that didn't really start until middle school. Big congrats to her on her blue ribbon...there's nothing like a little recognition for hard work. The great mold experiment....ah, the good ol' days. I did that one, too! Congrats on a job well done. Things don't have to be complicated to be good. Congratulations on the blue ribbon. You're saying mold isn't classy?